The DP Series – Industrial Grade, Direct Pressure, Abrasive Blasting Cabinet System is engineered for industrial applications and everyday use. These economical vibratory tumblers are great ‘starter’ systems and for those unfamiliar with mass finishing. Both deburring and polishing can be accomplished on a limited budget. With a Full Pot Using a 1/4" Nozzle and Blasting at 50 PSI the Pressure Pot Will Empty in About 10 Minutes. When the Foot Pedal is Released it Takes About 10 Seconds for the Pressure in the System to Bleed Out Through the Nozzle. The Plunger in the Pressure Pot Will Then Drop Allowing the Cleaned Media in the Storage Hopper to Refill it. Refilling Can Take 20-60 Seconds Depending on Media Type and Grit Size. Model DP3630 Features a Pull-Through Type Enclosed Dust Collector with Motor and Impeller on Clean Air Side, 14-Gauge Welded Steel Construction, Full Size Access Door, 12 Tubular Filter Bags, Removable Dust Drawer and Exhaust Muffler. 36" x 23" x 30"
41" x 68" x 35"
40" x 78" x 37"
53" x 78" x 37"
60" x 31" x 30"
The DP850 Retrofit Package Converts our Siphon Type Cabinet (SS Series) to a Direct Pressure Unit. 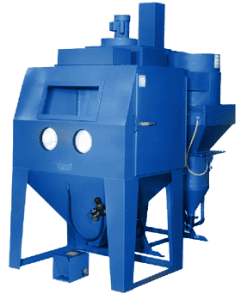 This Unit Can be Adapted to Any Standard Siphon-Type Cabinet With a Minimum of Effort to Afford You the Speed and Efficiency of Direct Pressure Blasting. Includes 850 CFM Abrasive Separator. Abrasive Capacity: 150 lb. Overall Dimensions: 70" x 104" x 40". Additional Piping and Modifications Must Be Made to Existing Cabinet. Glass Beads are a round, spherical media that produce a softer and brighter finish angular medias. Glass Beads are used for blasting, peening, honing, cleaning, and light deburring.